A young man in Phrygian costume with breeches and a long sleeved tunic sits right, on a stool; a chlamys, fastened with a brooch at his right shoulder, hangs down over his back and serves also as a covering for the seat. Both his legs are drawn up and his head is turned back to the right and supported by his left arm with his left elbow resting on his right knee. His right arm rests in his lap. Robert (see Literature) follows Michaelis and Matz in considering this fragment to be from a sarcophagus and from the scene in which Eros tells Paris of the attractions of the beautiful Helen, a subsidiary action in the representation of the Judgement of Paris. There are, however, no known sarcophagi in which Paris adopts the peculiar pose seen here: he is usually seated in a more relaxed manner and directing his attention to the right rather than turning to look up to the left. While it is not unknown to find isolated sarcophagus fragments which have no close relationship to a known type (as, for example, the fragment of a Season sarcophagus, Soane M532/Vermeule no. 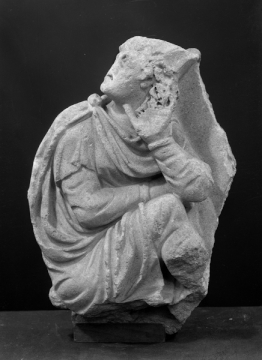 307), the suggestion that this fragment might instead come from a relief with two captive Phrygian barbarians grouped beneath a trophy is a plausible alternative.1 The peculiarity of the pose, with body twisted about and the expression of awed fear, which do not seem appropriate for the depiction of the shepherd prince Paris, a prominent figure from a Trojan myth expressed in funerary sculpture, seem far more appropriate for a Phrygian or Parthian barbarian cowed by the dominion of Rome. 1 Compare the larger fragment from a Roman second century triumphal monument at Ramleh, near Alexandria, a bound barbarian in pose similar to this figure; no. 1772 in the Hall of Roman portraits in the British Museum, Smith, Catalogue, III, p. 117; here a colossal standing figure appears to have formed part of the group at the left. 2 A. C. Levi, Barbarians on Roman Coins and Sculpture, 1952, New York, p. 22, pl. IX, 5. C. Clairmont, Das Parisurteil in der antiken Kunst, Zurich, 1951, p. 80, no. K 247. C. Robert, Die antiken Sarkophag-Reliefs, II, p.18, fig. 15 after a drawing by Eichler, 1873, and description by Prof. Matz. Adolf Michaelis, Ancient Marbles in Great Britain, trans. C.A.M. Fennell, Cambridge, 1882, p. 480, no. 30.